The successor of Canon’s EOS 40D went public today, and what a lovely piece of picture taking equipment the EOS 50D SLR appears to be too. Understandably, the two cameras bear a close resemblance, but not so much that you can’t tell the EOS 40D has received an upgrade. What separates it from its predecessor is its insides. 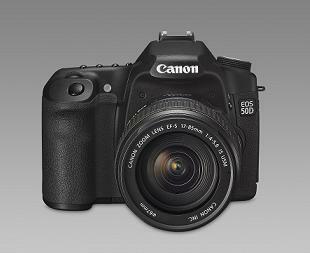 The EOS 50D packs a 15-megapixel CMOS sensor, Canon’s latest DIGIC 4 image processor to deliver 6.3 fps continuous shooting and according to Canon, ‘outstanding speed and resolution’. As well as all that, it features a whopping 3-inch VGA LCD screen, HDMI output, and redesigned photo diodes and microlenses that’ll allow more pixels to fit on the CMOS sensor without compromising the quality of the image. Canon has really worked its arse off to try and reduce noise levels inside the sensor as well as provide improved ISO levels expandable from 3200 to a highly sensitive 12800. The specs don’t stop there. By switching the camera to Live View Mode to display a real-time image on the LCD, photographers are provided with three auto focus modes – quick AF, live AF, and face detection live AF. Canon’s latest camera also features a new quick control screen which shows the most commonly used settings and creative auto mode for automatic focus and exposure. Grubby hands need not be a bother anymore either, with its improved integrated cleaning system designed to repel and get rid of dust and the like from the imaging chip. Advanced amateurs and semi-professionals should prepare for its arrival in September when it will retail for around £1,200 or £1,500 for the EF-S model.